March 23, 2014 was a day of firsts. It was my first race of the season. 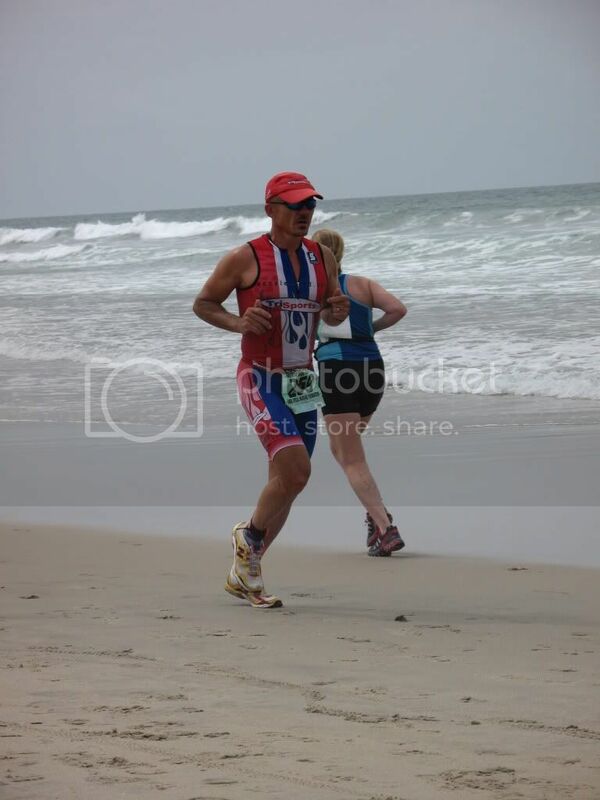 It was my first race in the 50-54 agegroup. It was my first race post injury. 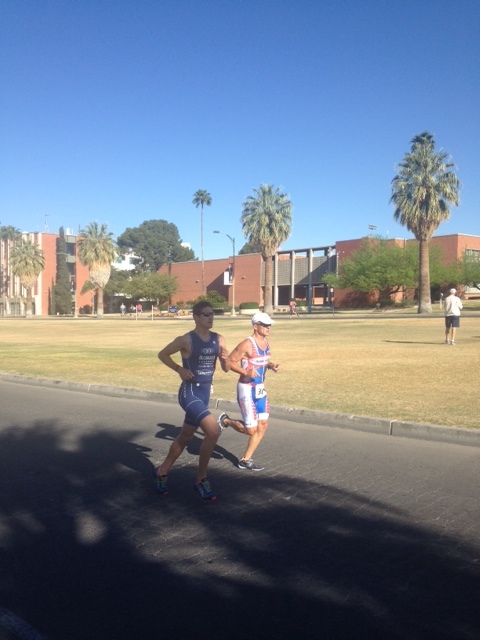 It was the Tucson Triathlon. 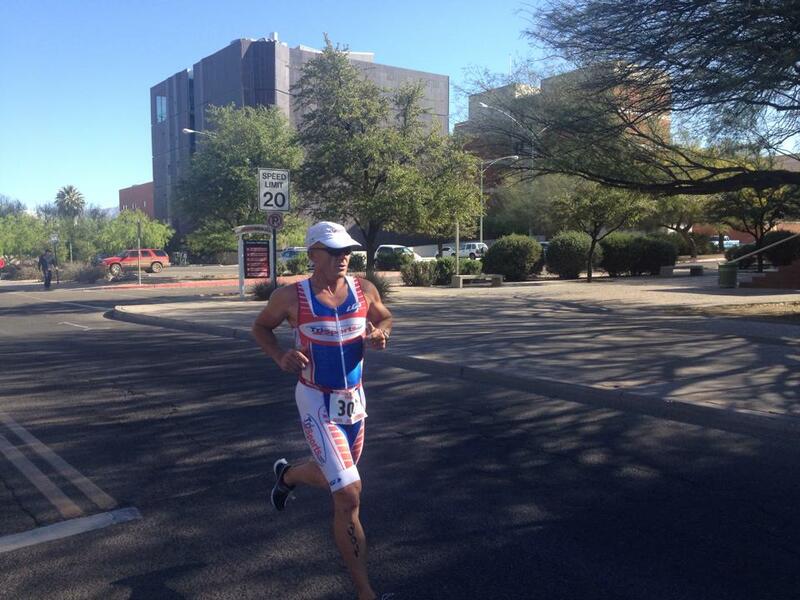 The Tucson Triathlon is the first race of the 3 race Tucson Triathlon series. 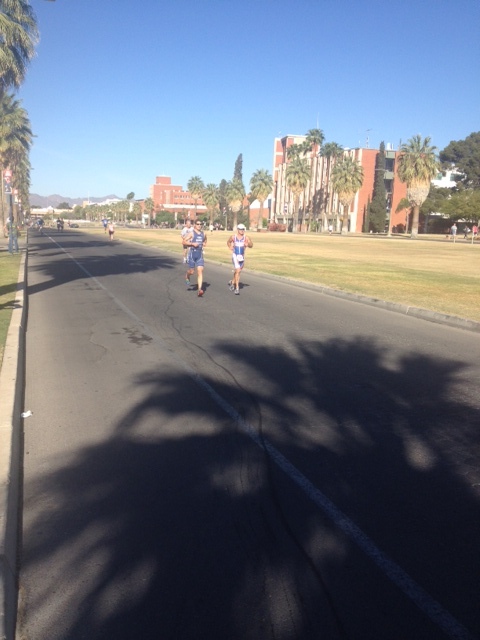 The race takes place on and around the University of Arizona campus. 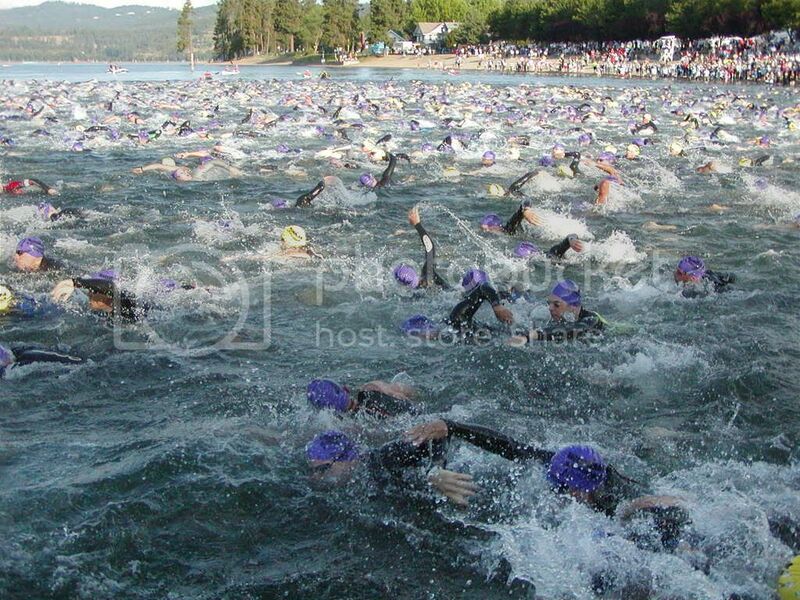 The sprint distance race consists of a 750 meter serpentine swim, a 12 mile 3 loop bike, and a 2 loop 3 mile run. My day started at 0400 with the sound of the alarm. A quick breakfast of waffles, got dressed and jumped in to my prepacked vehicle. I arrived at the race site at 0500. I racked my bike on an end spot and set up my transition area. After getting body marked I returned to my vehicle and took an hour nap since I was not to start until 4th from the last. Next on the agenda was a quick stop in the restroom. With about 45 minutes until start time I headed out with my coach, Brian Stover (Accelerate3), for a warm up run followed by some swimming. It was now go time! On the start command I was off. We started in 15 second intervals. Seven an a half laps of the 50 meter pool. I quickly settled into my pace and was feeling good. I caught my 15 second person at the 650 meter mark. I then enjoyed the draft. Out of the water in 12:25…about average for me. 12th fastest swim of the day and fastest in agegroup. On the short run to T1 I passed 4 people. T1 was fast and uneventful. Goggles off, helmet on, run to mount line and jump on bike. Once on the bike I put my shoes on and quickly got up to speed. I felt great on the bike and was passing many of the slower people who started ahead of me. On Euclid, the rough section of road, I stayed out of the aerobars to absorb the shock and keep the power going. As I came around on the third lap I slipped out of my shoes and turned into the transition area. As I hit the dismount line I jumped from my bike and hit the ground running. I racked my bike, removed my helmet, running shoes on, grabbed my hat, sunglasses and number…run. T1, bike, T2 time 31:27. 6th fastest for the day and fastest in agegroup. On the run I put on my glasses, race number and hat. Prior to the race I had told my coach I would be happy to run under 19 minutes, I had taken 15 weeks off of running with a heel stress fracture during the second half of last season. As I went into the first loop of the run, coach Brian was starting his second loop (he started ahead of me). Perfect timing…a rabbit! I stayed with him till the first turn around then dropped back about 10 yards and tried to hang on. The second loop I maintained my pace and pushed hard to the finish line. I crossed the finish with a run split of 18:57…goal met! 7th fastest run of the day and fastest in agegroup. My overall time, 1:04:49, put me in 5th place overall and 1st in the 50-54 agegroup. 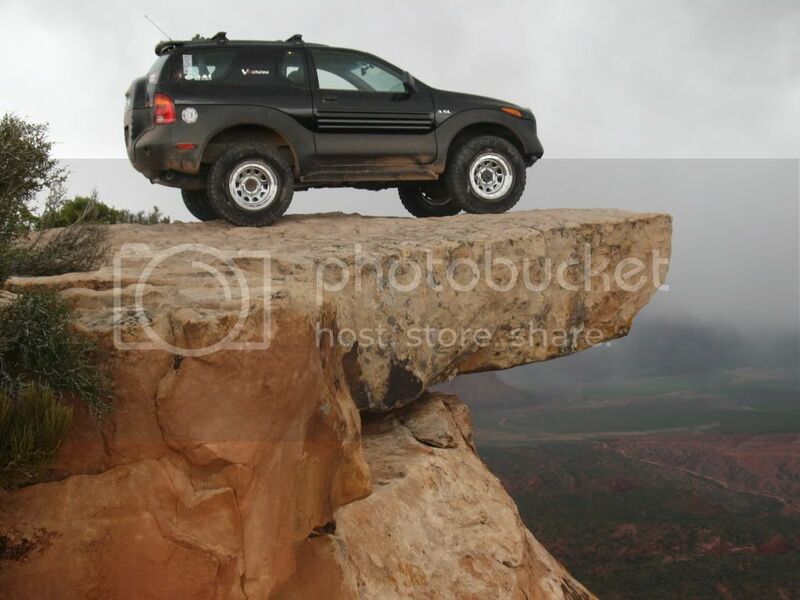 This entry was posted on March 25, 2014 by Billy O. 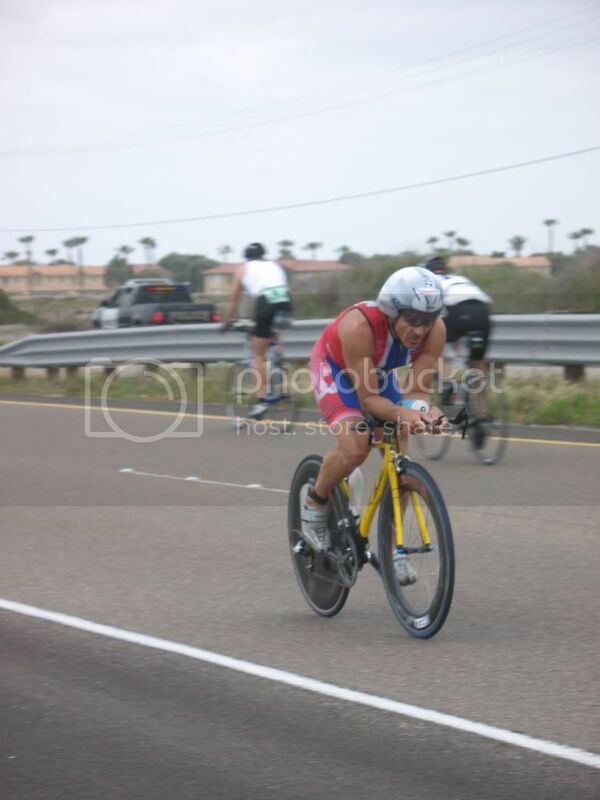 It was filed under accelerate3.com, bike, multisport, run, swim, Triathlon, TriSports.com, Uncategorized and was tagged with accelerate3, arizona, bike, hildibrand, multisport, run, swim, tri, triathlon, trisports.com, Tucson, u of a.